Wahl's NEW! 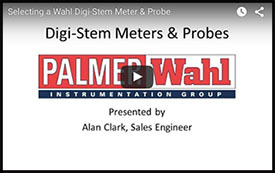 DST400 is the newest addition to Wahl's Digi-Stem® family of Digital Thermometers. They are wide range, high accuracy thermometers designed for many applications where accurate and reliable temperature monitoring is important. Set Thermocouple Type Programs meter for use with J, K, T, E or S type thermocouples. One meter - 5 options! Meter Calibration Calibrates mV measurements of the meter. Cold Junction Compensation Calibration Calibrates CJC sensor for increased accuracy. Set Sample/Display Rate Optimizes sample rate to match your process speed and maximize battery life. Tamper Resistance DSTCAL software is required for all temperature adjustments, providing added security. The Wahl DST400 can be used with a wide selection of thermocouple probes from Wahl, and is compatible with third party thermocouple probes with a ½" NPT instrument fitting. NEMA-4X Stainless Housing withstands use in industrial process monitoring applications, indoors or out, including food, beverage, pharmaceutical, petrochemical and tire & rubber. The DST400 replaces the DST300 and DST200.